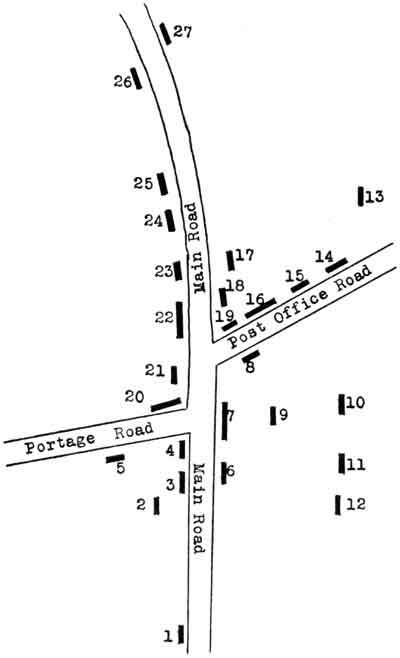 The accompanying map-plan shows Winnipeg's famed Portage and Main district as it was in 1869. It has been reproduced from a book written by Alexander Begg and Walter Nursey titled Ten Years in Winnipeg. The year 1869, you will remember, was marked by the beginning of the Red River Resistance led by Louis Riel and the following year was to see Manitoba admitted as a province to the Dominion of Canada. The authors of the book mentioned above had this to say, however, about life in Winnipeg in 1869: "We had no bank, no insurance office, no lawyers, only one doctor, no City Council, only one policeman, no taxes  nothing but freedom and, though lacking several other so called advantages of civilization, we were, to say the least of it, tolerably virtuous and unmistakably happy." As you note the changes that have taken place, make a date to visit at least two points which are still distinguishable: Fort Garry Gate, across from the C.N.R. depot and the site of the first Manitoba Legislative Building; a plaque on the Banque Canadienne Nationale, 433 Main St. North, marks this.